The very best from the band the put worship music in the charts, this compilation brings together the greatest hits of worship super-group MercyMe. 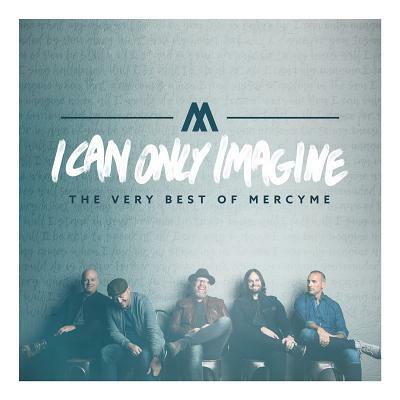 Few songs touched lives like MercyMe’s ‘I Can Only Imagine’. One of most popular worship songs of the past century, it was sung across the world by people in need of hope, in need of God. It was a calling for God’s presence that resonated with believers in a remarkable way. It also launched the career of a little-known group from Texas that only formed because the lead singer had to drop American Football due to an injury, and chose to pick up Choir instead. That group was MercyMe. Here, on this brand new collection, you’ll find the very best of MercyMe. From the awe-inspiring ‘God with Us’ to the beloved “Greater” and, of course, the title song ‘I Can Only Imagine’. This is the very best from the group who brought worship into the Billboard top 100 (peaking at No.5). And coming soon to screens is the amazing story behind the song - a full-length feature film of ‘I Can Only Imagine’ starring J. Michael Finley and Dennis Quaid. Also coming is frontman Bart Millard’s own autobiography, telling readers the story of his life, and of how once song changed his entire life. For fans of MercyMe, this is the perfect way to rekindle your love of their bestselling music. A worshipful tour down memory lane, I Can Only Imagine will reminds you of what the very best of Christian music can be. I Can Only Imagine by Mercy Me was published by Fair Trading Services in March 2018 and is our 710th best seller. The ISBN for I Can Only Imagine is 0736211850591. Be the first to review I Can Only Imagine! Got a question? No problem! Just click here to ask us about I Can Only Imagine. The definitive collection of MercyMe's favourite songs together on one album. "I can only Imagine," arguably one of the most popular and powerful songs in Christian music history, has taken on a life of its own and is now the subject of a worldwide motion picture of the same name.In celebration of the movie release, MercyMe is unveiling I Can Only Imagine - The Very Best of MercyMe, a collection of the band's best-loved songs spanning their illustrious career. In addition to the original of "I can only Imagine," this release will include a special version of the song made just for the movie called "Re:Imagine." This anthology is the definitive collection of MercyMe with recent favourites "Flawless" and "Greater" as well as the classics "Word of God Speak," "Bring the Rain" and "God with Us." Now Playing: I Can Only Imagine The Movie Session Your browser does not support the audio element.